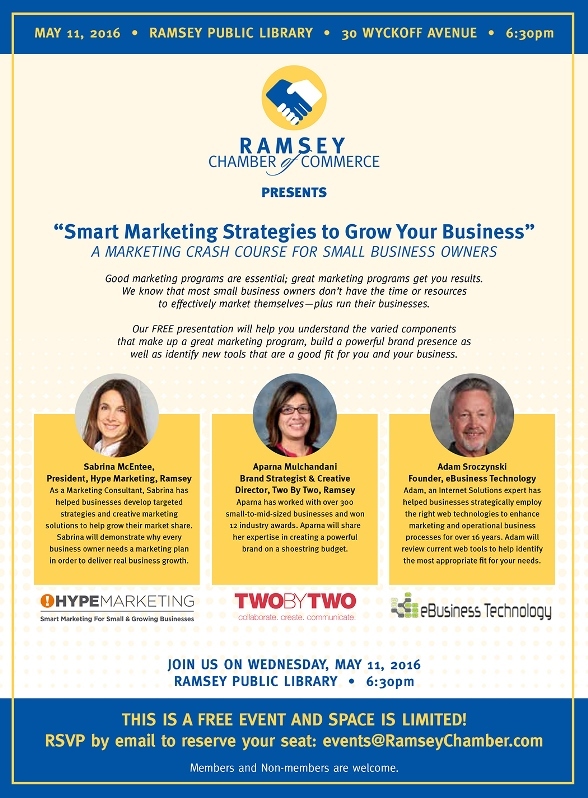 We are delighted to be participating with Sabrina McEntee, Hype Marketing, and Aparna Mulchandani, Two by Two, in presenting “Smart Marketing Strategies to Grow Your Business” in cooperation with the Ramsey Chamber of Commerce on May 11th, 2016 at 6:30pm at the Ramsey Library. Sabrina will be focusing on the importance of having a marketing strategy. Aparna will discuss valuable branding recommendations. I will be reviewing categories and consideration of various tools for presenting your business online. We look forward to having local businesses attend. Please see below for details. If you’re interested, please email your rsvp to events@ramseychamber.com.